A massiveve impact from an asteroid or comet occurs on Earth an average of once every million years. Many eminent scientists consider massive impacts as a possible impediment to the evolution of advanced intelligent life in the Universe. In the early stage of their formation planets are under constant bombardment from particles ranging from a few nanometres to tens of kilometres in size, according to recent analyses of asteroid samples by scientists at Okayama University –the first reported analysis of grains taken directly from a solar body in space. 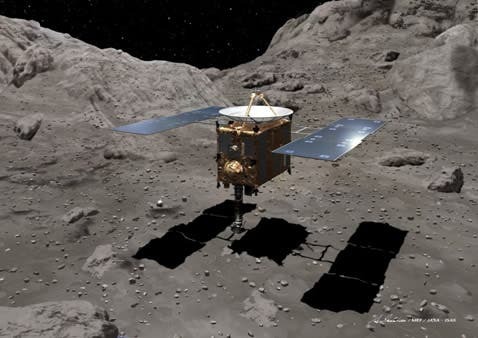 The Japan Aerospace Exploration Agency (JAXA) sent a probe to investigate the near-Earth asteroid 25143 Itokawa as part of the Hayabusa mission. The aim of the mission was to obtain and analyse samples of asteroids and so learn more about how the solar system evolved.Asteroids are considered to comprise intermediate products in the evolution of solar bodies. Investigating asteroids can provide information on planetary evolution. The information that can be retrieved from meteorites – asteroids that fall to earth – is limited as a result of the significant surface changes meteorites undergo when they enter the atmosphere. In contrast, the Itokawa samples comprised ‘chondritic’ material, unmodified by this sort of melting or differentiation. The capsule containing the asteroid grains returned to Earth in June 2010. Mass spectroscopy analysis confirmed that the oxygen isotope ratios differed from stone found on Earth, confirming the extra-terrestrial origin of at least 4 of the 5 samples. Using scanning electron microscopy, the researchers identified craters 100-200 nm in size as well as particles adhered to the asteroid surface. They suggest that a combination of disaggregation, cratering, melting, adhesion, agglutination, and implantation/sputtering affect the asteroid surface as a result of bombardment by submicrometre sized particles in space. “Impact appears to be an important process shaping the exteriors of not only large planetary bodies, such as the moon, but also low-gravity bodies such as asteroids,” explained Eizo Nakamura and colleagues at Okayama University and the Japan Aerospace Exploration Agency (JAXA). Among the other features observed in the grains were a type of feldspar that would have formed during slow cooling from temperatures of 860 °C. These temperatures and cooling dynamics could not have been achieved in a rock with a radius of only 300m. 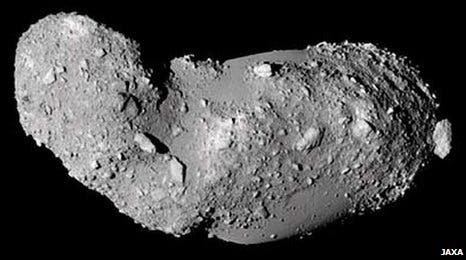 As a result it is likely that the asteroid Itokawa originated from a larger asteroid. 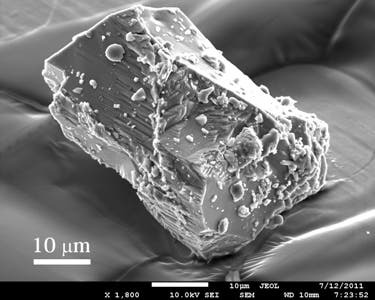 The researchers identified a considerable number of glassy particles on the asteroid surface, as well as iron particles associated with weathering processes in space from previous spectroscopy studies. However, they also suggest that previous near-infrared spectrocsopy studies may have underestimated the deposition of glassy materials and the resulting absorption. “We suggest that the chemistry and textures of Itokawa’s surface reflect long-term bombardment of equilibrated chondritic material, at scales of 10−9 to 104 meters,” conclude the authors, adding that impact processes in general play a central role in the evolution of planetary bodies.